The introduction of our Lodge into the Masonic environment in 1996 was not without some degree of comment. The introduction of a new lodge with new ideas, new procedures for refectory, new targets for its benevolence and an unashamed emphasis on excellence, was a fertile target for uninformed criticism. However, as more brethren experienced our ethos and participated in our proceedings, the critics were silenced, and our advocates emerged. Our methods and objectives came to be seen as forging a constructive way forward for Freemasonry in today's environment. Others saw the wisdom of our direction and so we saw the creation of other lodges within the '500' group. Our Charitable Trust has also set the standard, with other lodges following our example, by identifying a special charitable cause, and setting up a trust charged with supporting that cause, in our case the Arts, particularly music, in the Auckland region. Our enjoyment of the refectory proceedings has been maintained, with an insistence upon high quality food and music, being enjoyed in a convivial atmosphere of brotherly love and support. Our toast list remains strictly curtailed, but enhanced with the fires which form an inseparable part of our proceedings. Bro Howard Wyatt first outlined the methodology for conducting the fires, with innovations by Bro Noel Ryan and Bro Tom Clarke. The fires are now a high point of each refectory, not the least because of the range of variations available! For those seeking perfection the correct version is printed in the programme. 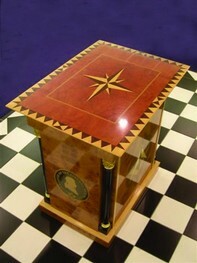 Our lodge has a number of unique features which reflect the wish of its founding fathers to reinforce the philosophical and historical richness of the craft while at the same time improving efficiency and enhancing presentation. The Mozart logo (Bro Noel Ryan), the presentation to candidates of Bro Laurie Southwick's paper on 'The Liberal Arts and Sciences' on completion of their Second Degree, our unique by-laws (Bro Winger), Bro Mozart's chain song which is sung following the closure of the lodge (Bro Wyatt), the introductory booklet Freemasonry, an Ancient and Honorable Institution' (Bro Ingram), our Compendium (Bro Winger) and the celebratory white carnations worn at the initiation of a new candidate, are all examples. An educational group meeting each alternative month reinforces our commitment to Masonic history ands principles.